The total length of measuring lines is a very important factor that is to be considered during measuring lines design. Measuring lines length is determined as a total length of the cables used for connection of sensors to the measuring line (including the cable between interface converter and the first sensor of the measuring line). Total cable length determines the speed values that will be available at the interface. 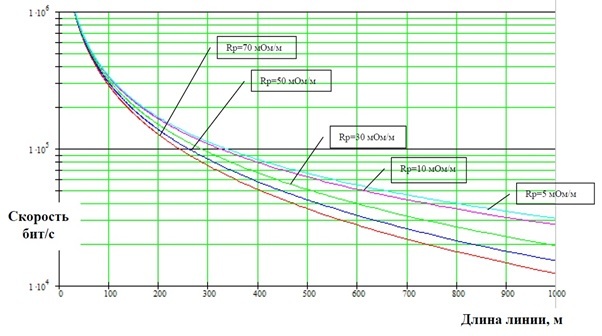 From the diagram shown above one can see that for the speed value of 1 Mbps the total measuring line cable length should not exceed 40 meters, while for the speed value of 100 kb/s the total measuring line cable length is limited by cable type – for the cables with low resistance per unit length (5 mOhm/m) it is 340 meters, and for the cables with high resistance per unit length value (70 mOhm/m) it is 250 meters. in the case if standard power supply scheme for digital sensors is used (via one of the twisted pairs) the cable type should be selected in accordance with table specifying cable types recommended for various measuring line parameters. Maximal measuring line length for CAN interface at the data transfer speed up to 100 kb/s is 280 meters, maximal measuring line length for RS-485 interface at the data transfer speed up to 19,2 kbps for the cable with resistance per unit length below 10 mOhm/m (AWG 15) is 800 meters. RS-485 115.2 kbps Cabeus RS-485 2x2x24AWG/7 Cable for interface RS-485/RS-422, 2x2x24 AWG, multicore, operational temperature range – 45 C – +80 C.
RS-485 115.2 kbps Cabeus RS-485 2x2x22AWG/7 К Cable for interface RS-485/422, 2x2x22 AWG (SF/UTP), multicore, operational temperature range -55°С – +70°С. RS-485 115.2 kbps Cabeus RS-485 2x2x22AWG/7 Cable for interface RS-485/422, 2x2x22 AWG (SF/UTP), multicore, operational temperature range -55°С – +70°С. RS-485 57.6 kbps Cabeus RS-485 2x2x22AWG/7 Cable for interface RS-485/422, 2x2x22 AWG (SF/UTP), multicore, operational temperature range -55°С – +70°С.